As the lights went out in 1939 the deaths went up rocket fashion, and the death rate in Great Britain stayed high for years. Darkness can provide a lot of cover for crime, and a government enforced darkness you might think almost endorsed a rise in crime. Unfortunately, that high death rate came from another source: death on the roads. Street lamps gone and car headlights little more than a glow that failed to illuminate their chrome-work, let alone the road ahead, left more dead on our roads than we have ever known since, even with the current number of cars. In October 1939 in Cambridge, though, Detective Inspector Eden Brooke, of the tiny city police force, is a man who stumbled when he saw and now sees even less, his eyes injured from the First World War. Hating sunlight, disliking daylight, he works best at night, which is also the time he swims in the pools along the Cam: the calm water carrying strange noises he is forbidden to investigate. Meanwhile, Lorries trying to make their way through the blacked-out streets and escape the city, when stopped, have their drivers make a run for it, and blood seep from their closed backdoors. A body in a graveyard, a drowned lorry driver, an abattoir no longer in use, all its slaughter now done. These are the things that DI Brooke must investigate. In the meantime, the army has moved into quarters on the edges of the city, performing secret manoeuvres at night; in the city the tarts are continuing to do business; the students may or may not still be at their games, such as climbing the college roofs; in locked college lecture theatres restricted briefings are given to scientists; and the local branch of the Communist Party is trying to get its members registered as Conscientious Objectors. DI Brooke has his work cut out to make sense of it all. The Great Darkness is nearly 350 pages of close-printed text, though it has seventy-two chapters which means it is shorter than it might seem, but has the consequent advantage or disadvantage of swapping scenes and points-of-view frequently. It also relies on being historically correct, and too often it seems not to be. That in turn is due to its attempts to merge too many criminal elements, plots and secrets – for instance, a bankrupt farmer, an illegal meat racket, and government animal experiments all need to occur at the same time (oh, and a connection with a northern crime gang), which stretches one’s credibility. If there is to be a second in the Eden Brooke series it must be less convoluted. 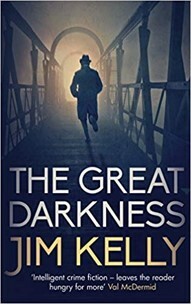 I doubt that Jim Kelly (who has written the Philip Dryden series set in present day East Anglia) has been able to think himself into the early months of the War, and his editor has let him down. Someone wants to send a letter by first class post (first and second class post only arrived in 1968); there is a British Restaurant in Cambridge, which appeared nowhere in Britain before October 1940, and nationally only in the Spring of 1941; this is said to be the Phoney War – someone may have used that phrase in an American newspaper report, but it was not common in Britain until long after the period had passed. Lancaster bombers fly two years before their invention. Meanwhile, the motivation of the Communist Party members is avoided: Hitler and Stalin had allied under the Ribbentrop-Molotov Pact and jointly invaded Poland; CP members may not have been actively pro-Nazi, but they opposed the war without being pacifists. Cambridge could offer a lot more as a home to war-time crime. Wait till the other universities start to send their students; wait till more refugee scientists start to be given roles; wait till the airmen from the Dominions come in from their fenland aerodromes looking for some entertainment; and later still the Americans with their big fat wallets. With proper plotting and more research Jim Kelly could be on a long-term roll.